"IN SEOUL, the South Korean government is staring nervously across the border, wondering about the succession under way in North Korea. The city is also preparing for a G20 summit in November. But the word on everyone’s lips is cabbage. The price of this humble vegetable, which forms the basis of kimchi, the Korean national dish, is soaring. Everyone from the president to the commonest crook and blogger is getting in on the act. It is hard to exaggerate the importance to Korean life of kimchi, which is usually made of fermented cabbage. Its presence at every meal, as well as its health benefits, give it an almost religious status. It is a national symbol, and the one food item that (in an entirely unscientific poll undertaken by The Economist) a majority of Koreans “cannot live without”." P.s. The sesame leaf has an after taste that might displease some but not me. I have acquired the taste. I had the opportunity to join a Kimchi making event in Gwangcheon and here; albeit a pretty bitter experience. I am thankful for it though. Kimjang is a traditional Korean event in which kimchi is prepared for the coldest 3 or 4 months of winter. 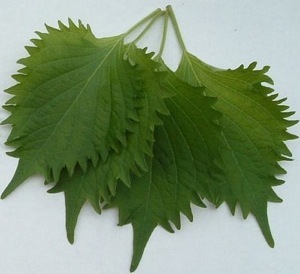 Kimjang usually started in late October or early November and lasted for 2 or 3 days with help from many people. The number of cabbages prepared depended on the number of household members, usually between 100 and 200 cabbages. Considering the number of cabbages and amount of preparation for Kimjang, it was not a job for just 1 or 2 persons. People considered it as a major annual event, so close relatives, several neighbor housewives, and a few strong men all pitched in and worked together. People who participated in Kimjang helped wash cabbages, prepared materials, and stuffed ingredients inside each cabbage leaf. 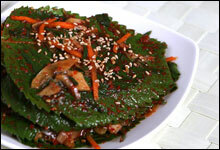 Read the recipe at Maangchi for sesame/perilla leaf kimchi.